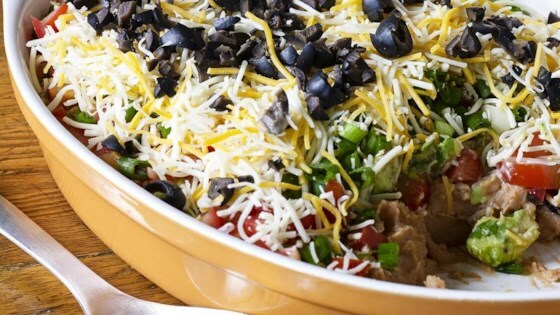 "My mom's Seven Layer Dip is a big hit at all small gatherings! Refried beans are layered with guacamole, seasoned sour cream, veggies and cheese. It's perfect for dipping tortilla chips! The dip traditionally takes less time to disappear into bellies than it does to prepare." In a medium bowl, mash the avocados. Mix in lime juice, cilantro, salsa, garlic salt and pepper. In a small bowl, blend the sour cream and taco seasoning. In a 9x13 inch dish or on a large serving platter, spread the refried beans. Top with sour cream mixture. Spread on guacamole. Top with tomatoes, green onions, Mexican-style cheese blend and black olives. I made this for my Super Bowl party and my guests loved it! I personally just don't like the stuff in it but I am told it was really great! We brought this for watching a football game and it was gone by the end. Very tasty (even when I substituted fat free sour cream), and simple to make! Very good recipe. I just used the already made guacamole because I was short on time. I really liked the sour cream-taco seasoning mixture! Thanks!